Ursula Hart is owner of this incredible place near Palgrave for animals large and small. Our donation last December was in-kind, with a purchase of beds, cat condo, and grooming supplies from Rens Pets Depot in Scarborough. Mourice McIntosh, store manager, is a big supporter of The Benjamin Project and gave us a generous discount on the order. Ursula was thrilled. The 2 dogs in the photo are rescues who Ursula has trained to be blood donors and thereby save other dogs! She has many other dogs and many cats and runs an adoption program for those which are suitable for adoption. The Benjamin Project is a proud partner of Haven of the Heart. Schoep’s story is a heart-warming tale about the intimate relationship between a man and his ailing dog. When Schoep, a German Shepard, got close to 20 years old he developed a crippling case of arthritis. His human, John Unger, owed a lot to Schoep whose friendship rescued him from depression during a hard time in his life. So John began carrying Schoep into the water and cradling him there to relieve the pain of the arthritis until the dog was able to go to sleep. This amazing foundation, dedicated to saving the street dogs of Thailand, has now received a $300 donation from the Benjamin Project. They aim to help the many thousands of dogs abused, abandoned and starving in that country, where the Soi Dog Foundation was the first of its kind to achieve official not-for-profit status. The organization is now just over 10 years old, but it now has a shelter in Phuket and a clinic in Bangkok. Their track record includes thousands of vaccinations and sterilizations, together with the arrest of more than 30 dog smugglers. A worthy ally in the campaign to protect animals everywhere. 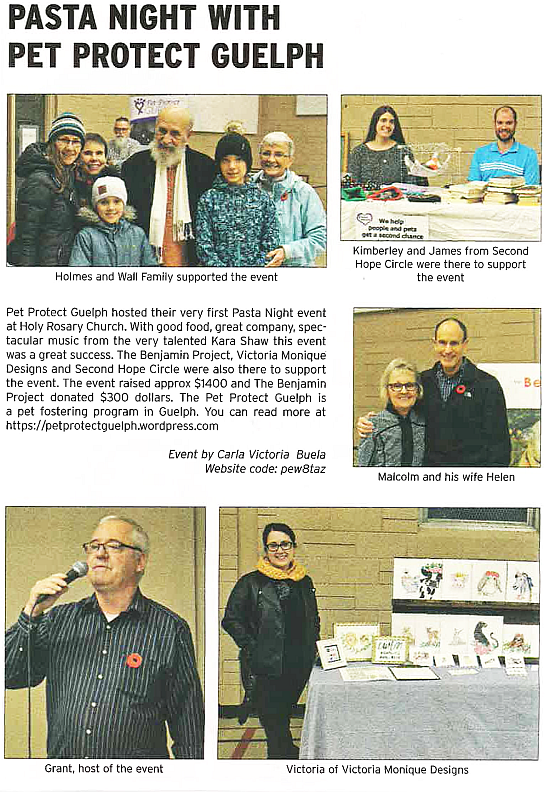 Photo is from from the 2 Benjamin book events at St Matthew Elementary Catholic School in Unionville Nov 2. 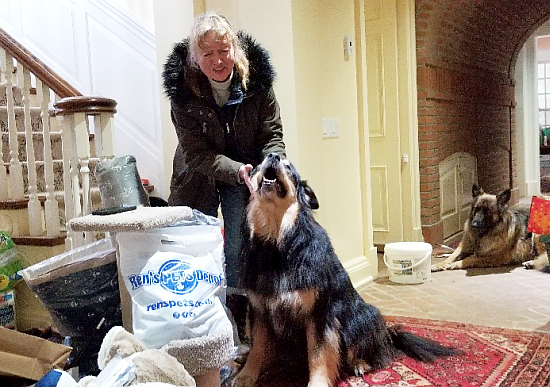 Roberta bustard on right is a colleague and supporter; Nora-gael Fitzgerald in middle is a librarian who organized the 2 sessions- one with grades 2-3, one with grades 5-6; Sondra Sieminski is on the board of soi dog Canada; Bev and her dog Luwana – a 3-legged Thai rescue – are sitting. Kids raised funds and also bought books (ie their parents did). The Benjamin Project Thanks You! Thanks to our many supporters, we have sold out the first print run of Malcolm’s new children’s book generating over $5,000 in donations! The beneficiaries of these proceeds, which have and continue to be dispersed in full, include Toronto, Guelph, Quinte, St. Catharine and Sault Ste. Marie Humane Societies, Haven of the Heart Sanctuary, and several rescue organizations. 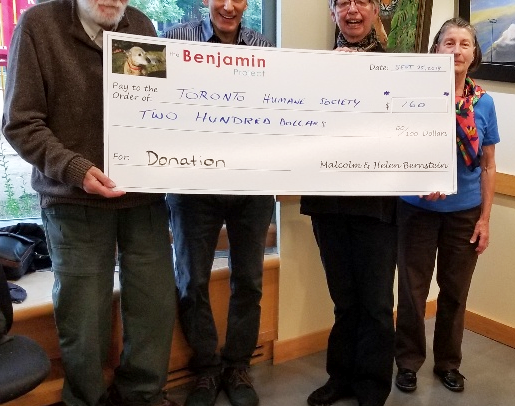 $200 for the Toronto Humane Society (plus another $60 from a contribution received after the event), the new ‘largest’ donation from the Benjamin Project. This photo was taken after a reading of the Benjamin book at the Leaside Public Library last September. The session was organized by Barry Penhale – a leading luminary in Canadian publishing – and his wife Jane Gibson. Some 60+ of Barry and Jane’s author series group were in attendance. Wonderful engaged people who were enthralled with the session and the opportunity to tell their pet stories as well! Hachi – movie remembers a faithful dog. Hachiko was a Japanese dog, a member of the Akita breed, who’s human was a professor at Tokyo Imperial University in the early 1920s. Each day the professor would come home from work by train, arriving at Shibuya Station. And each day, Hachiko would be there to meet him. But one day the professor died at work from a cerebral hemorrhage. In spite of the fact that his human no longer returned home from work each day, Hachiko waited faithfully at the station for another 10 years. Not long ago this incredible tale was made into a movie starring Richard Gere. And you can still buy a DVD of the movie on Amazon to follow the story for yourself. Did you know? 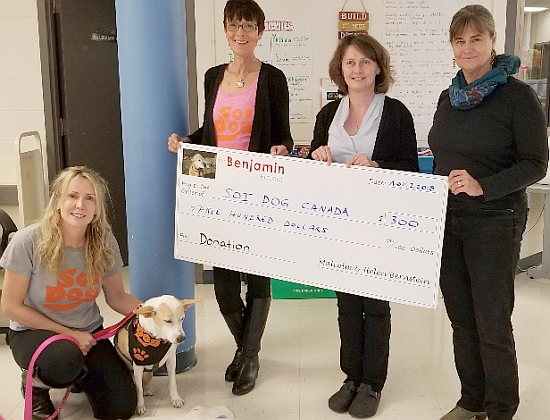 The Benjamin Project is a proud partner of Pet Protect Guelph. We love it when not-for-profit organizations become stronger by joining each other in alliances. The more of this kind of thing we have, the better for animals everywhere. Seniors appreciate Benjamin’s story too. And some even bring their grandchildren to listen in. Author, Malcolm Bernstein, gave this talk last August. 40 seniors attended and $200 was raised through sales of the Benjamin book for children. 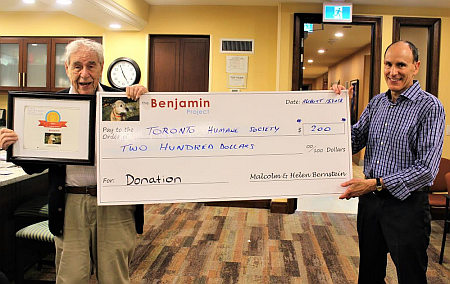 The money is donated by The Benjamin Project to charities for animal welfare. Also in this picture you see Dr. David Shaul who took the photographs in the first Benjamin Book, and his Benjamin Booster award, given to those who support the Benjamin Project. New Text: In this engaging article, author Malcolm Bernstein tells how he and his wife first met Benjamin and how the Benjamin book for children came to be. Malcolm takes you behind the scenes to find out what motivated his remarkable 18 year voyage.